The Los Angeles-based artist is renowned for his densely layered, richly patterned, and chaotically charged paintings, an idiosyncratic style developed during his time at Cal Arts where he learned to undermine aesthetic hierarchies and embrace the decorative and applied arts. 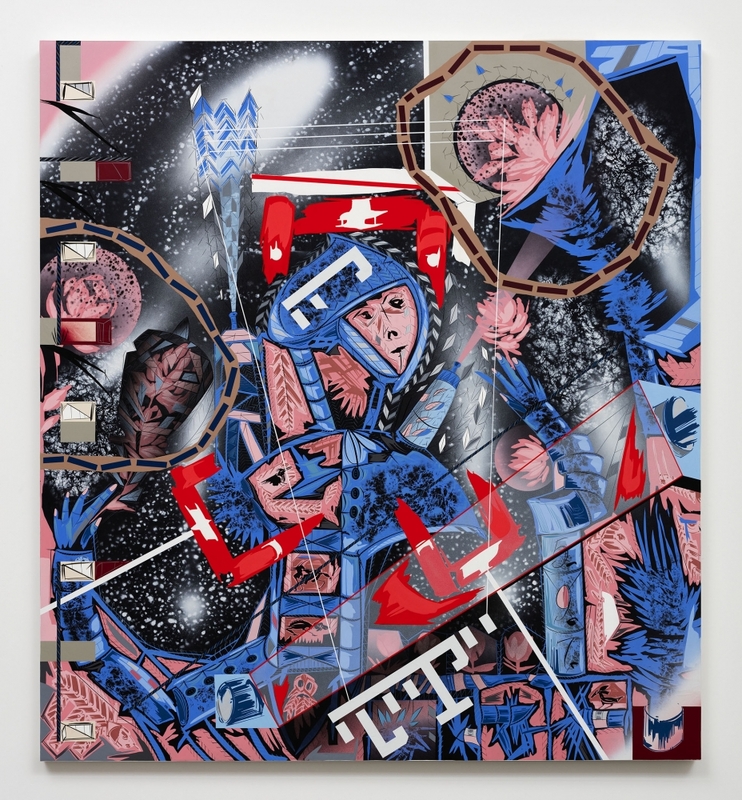 Pittman’s paintings appear as an amalgamation of multiple perspectives and picture planes, overlaid with his personal codex of iconography that is equally brutal and banal. Pittman’s early works were informed by the socio-political struggle resulting from the peak of the AIDS epidemic, racial tension, and LGBTQ+ civil rights struggles that defined the last decade of the 20th century, with later paintings moving into interior spaces both domestic and psychological. His most recent works have been almost wholly devoted to patterns and visual systems as emblematic of society, carving out his place in our contemporary culture of saturated image consumption with an eye also attuned to harmony. “Lari has developed a wholly unique mode of painting and mark-making that is in perfect company with artists in our program. Pittman’s embrace of pattern and design through a socio-political lens makes him stand out as a significant painter,” states David Maupin. Lari Pittman was born 1952, Los Angeles, CA, where he lives and works today. He received his BFA from California Institute of the Arts, Valencia, CA in 1974 and his MFA from California Institute of the Arts, Valencia, CA in 1976. In September 2019, Pittman will open a solo exhibition at the Hammer Museum in Los Angeles. Recent solo exhibitions of his work include Lari Pittman: Mood Books, the Huntington Library, Art Collections, and Botanical Gardens, San Marino, CA (2016); Lari Pittman, Le Consortium, Dijon, France (2013); A Decorated Chronology, Museum of Contemporary Art St. Louis, MO (2013); Lari Pittman, Villa Arson, Nice, France (2005); Lari Pittman, Los Angeles County Museum of Art (1996), Contemporary Arts Museum, Houston (1996), Corcoran Museum, Washington D.C. (1997); Lari Pittman: Works on paper, 1982 to 1995, the Hammer Museum, Los Angeles (1996). Select group exhibitions featuring Pittman’s work include The Long Run, Museum of Modern Art, New York (2017); Between Two Worlds: Art of California, San Francisco Museum of Modern Art (2017); Inaugural Installation, The Broad, Los Angeles (2015); The Art of Our Time, Museum of Contemporary Art, Los Angeles (2015); Art AIDS America, West Hollywood Library and One Archives Gallery and Museum, Los Angeles (2015); America is Hard to See, Whitney Museum of American Art, New York (2015); Earthly Delights, Museum of Contemporary Art Chicago, Chicago (2014); and Comic Future, Ballroom Marfa, TX (2013). Pittman has participated in multiple biennial exhibitions, including documenta X, Kassel, Germany (1997) and the 1997, 1995, 1993, and 1985 Whitney Biennial exhibitions. Pittman’s work is in numerous public and private collections, including The Broad, Los Angeles, CA; the Carnegie Institute of Art, Pittsburgh; the Fondazione Sandretto Re Rebaudengo, Torino, Italy; Los Angeles County Museum of Art; the Marciano Art Foundation, Los Angeles; the Museum of Contemporary Art Chicago; the Museum of Contemporary Art, Los Angeles; the Museum of Modern Art, New York; the National Gallery of Art, Washington, D.C.; the San Francisco Museum of Modern Art; the Hammer Museum, Los Angeles; and the Whitney Museum of American Art, New York.